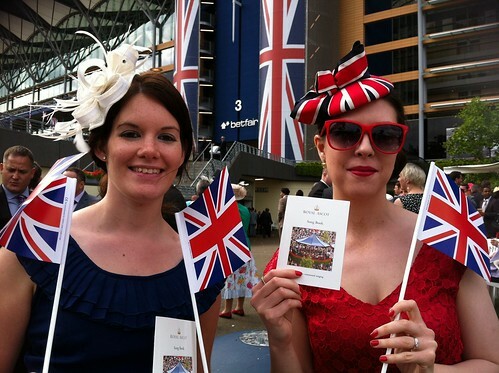 I love Ascot Ladies’ Day… Let me revise this. I love wearing a hat in the company of other, well-dressed hat wearers. I just really, really, REALLY love hats. But, I never wear hats. If you knew me, you might be surprised how much I love hats, because of my general lack of headwear. So, Ascot Ladies’ Day is the day I pay a wedge of cash to someone to let me into a field wearing a hat, so I can feel no shame all day long for indulging in my frivolous love of hats. 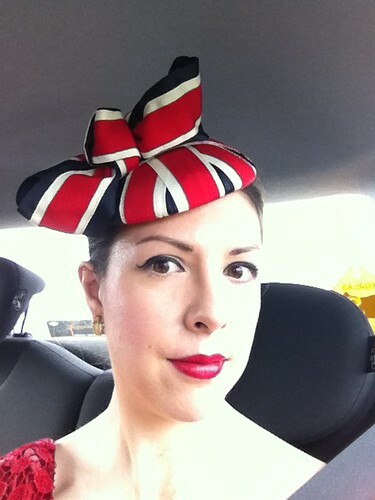 This is the Hobbs Britannia hat, and the moment I saw it in the paper, I had to have it. I bugged the hell out of the Hobbs customer service team until it was released, and as soon as it appeared on the site, I ordered it immediately. Then, it became the centrepiece of our grand scheme to colour co-ordinate for the day. I always go with two of my friends, Rachel and Lorraine, so it was decided that we should wear red, white and blue. I immediately bagged red, because it’s my favourite colour and I decided I needed an excuse to buy another red dress. I forgot I already had three. Rachel bagged white, and Lorraine went with blue. Then, we decided to each have one accessory with the Union flag on it. I already had my hat, so shoes and a bag were the obvious choices. For my wedding, I actually wore a pair of Union flag shoes, so Lorraine decided to track a pair down for herself. Rachel bought a really cool Union flag purse by LDC (and it was so cool I had to buy one too), and we were all set… apart from the dresses. At first we were all going to buy the same dress in different colours, but the one we had in mind just needed too much alteration, and the blue and the red weren’t particularly strong. So, we abandoned that idea and Rachel ended up with a beautiful white ASOS dress (that she won in a competition!) and Lorraine borrowed another ASOS dress from me. I wound up buying a pretty lace dress from Pepperberry. Hilariously, I spent ages before the event agonising over whether everyone else would be wearing this hat, because I’d seen it in the press a lot after I bought it, and it was a fairly obvious choice considering even the venue was decked out in the flag to celebrate the Jubilee – but no one else was wearing it. 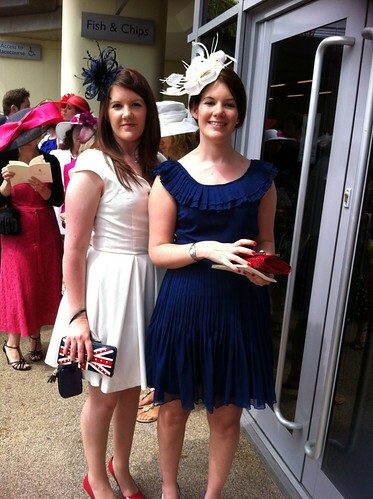 Someone else did have on the exact same dress as me, though… Typical! Here are Rachel and Lorraine – I cleverly cut off Lorraine’s amazing shoes, because I’m awesome at photography! Needless to say, we had a great time. We won a third of our stake back, which is great, and we even got to stay for the singing around the bandstand! 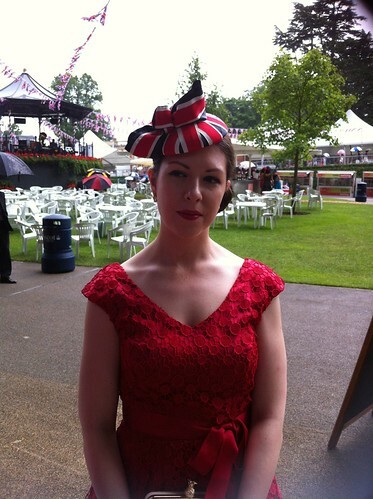 If anyone has any other British hat-wearing events they can recommend to me, please do! Six Weeks to OMG: Abandoned!